Scientists have long known that extended spaceflight leads to changes in the human body such as muscle atrophy, bone loss, and fluid shift. Increasing evidence has now been collected that suggests why astronauts may be experiencing visual problems as a result of spaceflight conditions. Russian biological experiment Bion-M1 revealed further insight into the issue of astronaut eyesight deterioration in space. Launched into space on April 19th, Russia’s first biological research satellite since 2007 carried into orbit a 2,450 kg space zoo before returning to Earth 30 days later. The extended length of the mission allowed researchers to gain a better understanding of the effects that long-term spaceflight exposure has on living organisms. With 45 mice, 8 Mongolian gerbils, 15 geckos, slugs, snails, and containers of microorganisms and plants on board, Bion-M1 orbited the Earth on a 30-day mission. The flight unfortunately proved fatal for all gerbils and 29 mice, however a key insight into the mechanisms behind the orbital visual problems was gained. We used to think that in zero-gravity, fluid travelled upward and that the quality of blood improved, but it turns out that it is the other way around. The arteries of the brain come under duress and their capacity is reduced by 40 percent. The institute also gathered valuable data on the influence of space travel on the spinal cord, inner ear, and processes at the genetic level. Orhtostatic intolerance is one reason astronauts are always seen seated after returning from an ISS mission. Seen here: Christopher Cassidy, Pavel Vinogradov, and Alexander Misurkin (Credits: NASA). Bion-M1 revealed that the capacity of the cerebral arteries decreases vastly in space, a symptom of orthostatic intolerance. Triggered by a disruption in blood flow, orthostatic intolerance is common in astronauts upon returning to Earth and readjusting to gravity. There’s a procedure to reduce the sodium [in space food] because there was some evidence that high sodium might contribute to vision problems that they’ve had on some of the missions. A recent study into the role of nutritional research in the success of human space flight has noted that prepackaged foods for the International Space Station were originally high in sodium at 5300 mg/d. This amount has now been substantially reduced to 3000 mg/g as a result of NASA reformulation of over ninety foods as a conscious effort to reduce astronaut sodium intake. They have a test called orthostatic tolerance… it basically says ‘can you stand up?’ and a lot of [the astronauts] were failing that, they couldn’t even stand up, and it was because they had low blood fluid levels. So they found out if they give them salt tablets or salt solution just before they come home, it improves their ability to stand up. If you take sodium you retain more fluids and build up your fluid volume. The subject of astronaut visual quality has been investigated previously. Research from 2012 in the journal Radiology analyzed MRI scans of astronauts returning from at least one month in space and confirmed that fluid shift also contributes to visual disruption as a result of intracranial pressure. 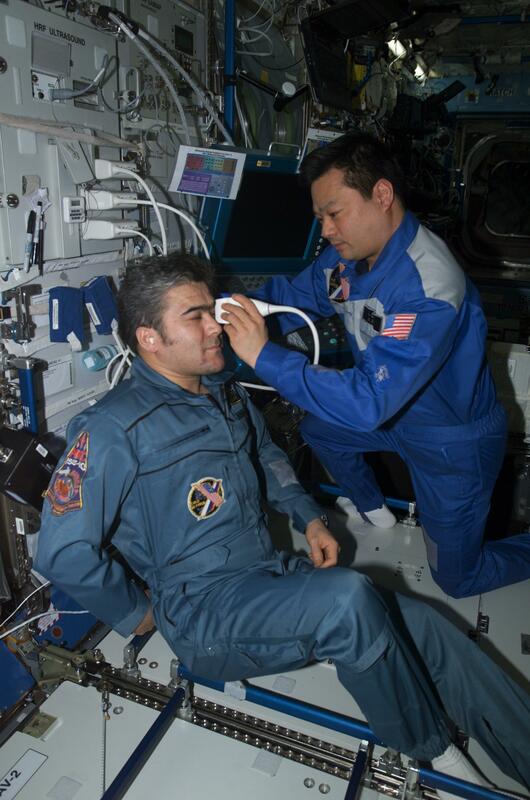 ISS Commander Leroy Chiao performs an ultrasound scan on the eye of Flight Engineer Salizhan Sharipov during ISS Expedition 10 (Credits: NASA). Mercury astronaut John Glenn carried a pair of ‘space anticipation glasses’ on board his capsule in order to improve his visual acuity. As well as this, a NASA survey of 300 male and female astronauts found that 49 percent of long-flight and 23 percent of short-flight astronauts had experienced problems with both near and distance vision. In some cases these visual problems persisted for years after their time in space. Currently, astronauts can live aboard the International Space Station for more than six months at a time. However, a mission to Mars may take years. Without dedicated further research into eye and vision abnormalities in space, there is a chance of astronauts developing serious vision damage or even blindness. Such research is therefore vital to ensure that humans become capable of travelling on longer-duration, interplanetary missions whilst maintaining their health. Image caption: Research into astronaut eyesight deterioration is vital to the progression of human spaceflight (Credits: NASA).